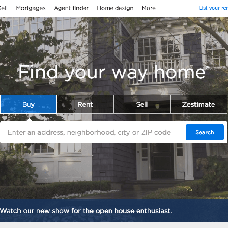 Zillow is a popular online real estate database company featuring over 110 million U.S. homes. It serves the full lifecycle of owning and living in a home: buying, selling, renting, financing, remodelling and more. If you want your real estate website to look like Zillow, then this offer is for you: We can make the main landing page of your site to look like that of Zillow, and we will also apply a similar colour scheme to the inner site pages. Let us know your preferences.